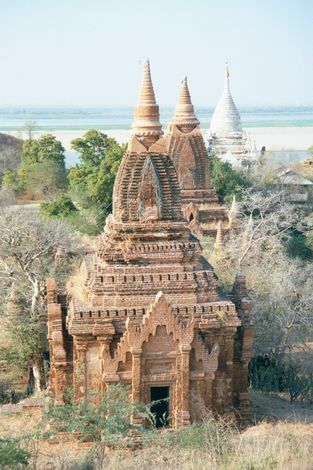 The ruins of Pagan are Myanmar's premier tourist attraction. They lie on the left bank of the Irrawaddy River--or the Ayeyarwaddy, as it's transliterated today in Myanmar, amd they're about 350 miles upstream from Yangon or 100 downstream from Mandalay. 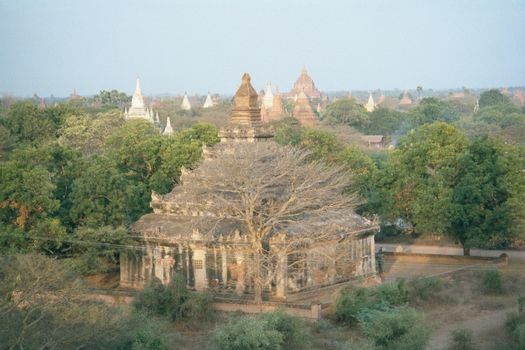 A thousand years ago--between about 1050 and 1300--this now-quiet place was the capital of a Buddhist dynasty that ruled over most of present-day Myanmar. The people generally built in wood, which means that nothing is left of Pagan except the hundreds of temples and pagodas that, more important than secular buildings, were built of brick. Marco Polo probably missed Pagan, though he came close during the Mongol invasion of 1287. The first Europeans indubitably to visit were those on a British mission of 1855. They must have had quite a shock. The river, in the background, has just picked up the tributary Chindwin and is about to curve south. It's an important location, at the center of a triangle reaching east to China, west to India, and south to the ocean; the location partly explains the rise of Pagan from one of many city states to a place of imperial status. The pioneering British in 1855 photographed Pagan, which begins within a walled area in the elbow of the river's curve and extends over several square miles of adjoining plain, shown here. Inevitably, the early visitors saw the two kinds of structures that remain of Pagan. On the left, a zedi. It's a reliquary monument, or at least a place where a treasure is kept. On the right is a gu, literally a cave. It's not really a cave, but the form can be traced back to true caves. In plain English, one might categorize the forms as pagoda and temple. Scores of each kind survive on the plain, which is farmed in the summer monsoon but barren in the winter. This is the driest part of Myanmar. Although the rulers of Pagan traced their origin to a first-century king, the first ruler of whom historical records survive was the 10th-century Anawrahta, a huge figure in Pagan's history. It was he who elevated Pagan to imperial status, chiefly by conquering the Mon, whose capital lay at Thaton, on the coast southeast of present-day Yangon. From Thaton, and ultimately from the Sri Lankan sources with whom the Mon were in contact, Anawrahta imported the Buddhist texts that would form the ideological core of Pagan's culture for centuries to come. The texts were known as the tipitaka, or "three baskets," and they were written in Pali on thousands of palm-leaves. Where to keep these fragile treasures? The answer: this building, the Royal Library, or Pitaka-taik. It dates from Anawrahta's time, though it was rebuilt in the 18th century. Appropriately, it is dark, dry, and fireproof; paradoxically, the roof is designed as though made of wood. The building is empty today--and inaccessible, as, alas, are most of Pagan's larger monuments. The archaeological authorities have gated them, leaving visitors to gawk from the outside or the ground floor. 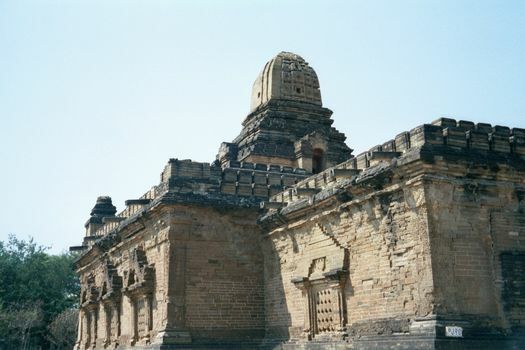 Nearby is another very early and unusual structure, also built before or during the reign of Anawrahta. 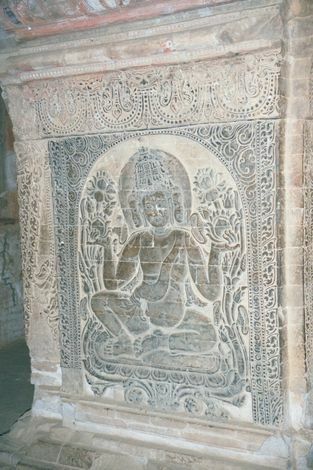 It once housed an image of the sleeping Vishnu, and the niches in the exterior walls also held sculptures, which may have been shaded by a now-vanished outer gallery. The structure lies within Pagan's city wall, which raises the obvious question: why a Hindu temple at the center of a Buddhist state? The answer appears to be that Anawrahta relied on Brahmans to generate the kind of folderol that royalty craves but which Buddhism shuns. The temple, by the way, is now called Nat-hlaung-kyaung, the "shrine confining the deities." That's a later and pejorative label; earlier, the building was more respectfully called Nat-daw-lyaung, the "shrine of the sacred deities." Note on sources: the captions in this and the next folder are based on Paul Strachan's Pagan: Art and Architecture of Old Burma (Kiscadale, 1989). 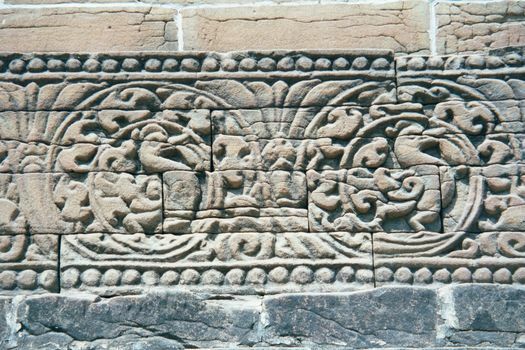 An even older structure, the pre-imperial Nga-kywe-na-daung, a zedi or pagada likely dating from the 9th century. This early form suggests, better than most, why the main body of a zedi is known as an anda, or egg. 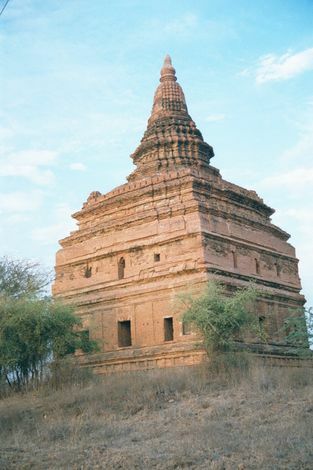 Like all pagodas, this one once contained a relic or treasure in a sealed box or tabena. All, or nearly all, of such treasures were looted long ago. In Pagan, by the way, the treasures were underground; that's an unusual arrangement, since usually they're close to the top of the structure. 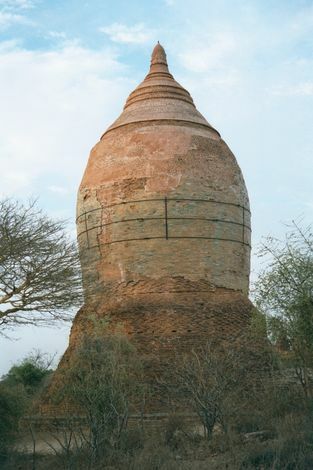 The Shwe-hsan-daw, built with a concave anda by Anawrahta. It stands just outside the city wall and was one of five such pagodas protecting his capital by spiritual force. The five terraces model Mt. 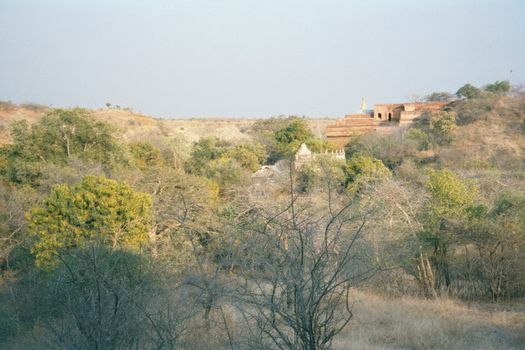 Meru, the home of the Hindu gods and the Buddhist center of the universe. 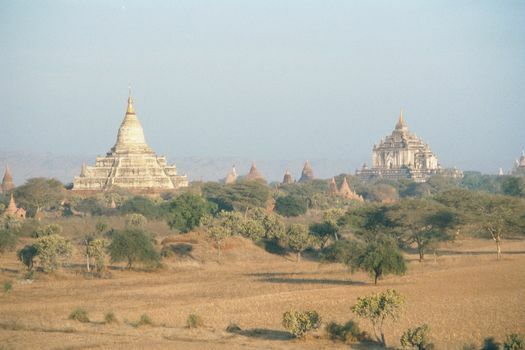 Atop the smooth anda is the ridged amalaka and the tapering chattravati, atop which is a modern finial or spire. 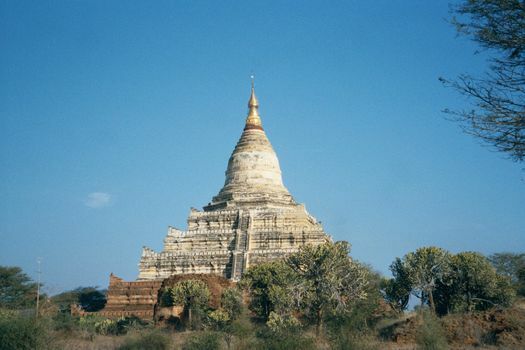 Like monks and other pagodas in Myanmar today, the whole structure is addressed as "Hpaya", "Lord," because it is taken not as a symbol of divinity but as an aspect of it. 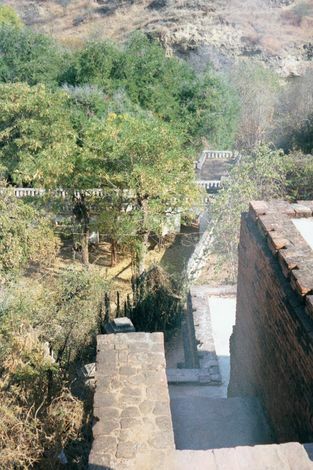 Looking down some of the medial and perilous steps at Shwe-hsan-daw. 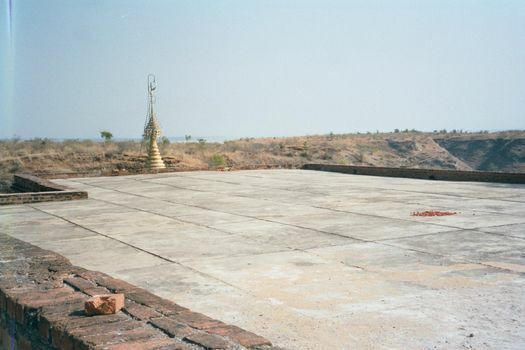 At each level, pilgrims would have circumambulated the terrace, which was decorated with now-missing glazed plaques illustrating the jataka, stories from the 550 lives of former Buddhas. Meanwhile Anawrahta was also building temples. Here, a true cave temple from his time. It's Kyauk-ku, one of the two oldest Buddhist temples at Pagan. It's remote today-- difficult to reach without hiring a boat--and it was secluded a thousand years ago, too, when it lay a couple of miles upstream from the city of Pagan. It's almost hidden, tucked into one of the many ravines that dissect the plain near the river upstream from Nyaung-U. By building at the bottom of the ravine, monks could tunnel horizontally into the earth and create caves for refuge. Kyauk-ku would be easy to miss if it wasn't for the finial, which sprouts beyond the edge of a roof that extends from the mouth of the cave and creates a porch sheltering a giant Buddha image. 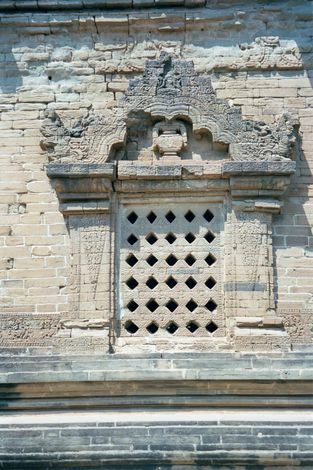 At the entrance, the door jambs are in an Indian style and are made of stone cut into bricks. Stone, which had to be imported, was used only rarely at Pagan, yet when used it was cut to simulate brick. Go figure. 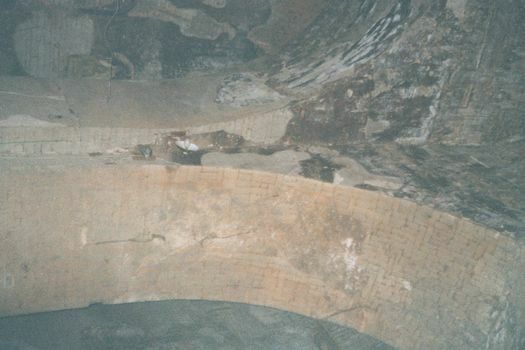 Inside, the arch and dome of the entrance hall. Deeper inside, tunnels lit only by candles (and the occasional camera flash) penetrate to tiny rooms where monks might meditate at length, undisturbed. It's an attractive site for a monastery. 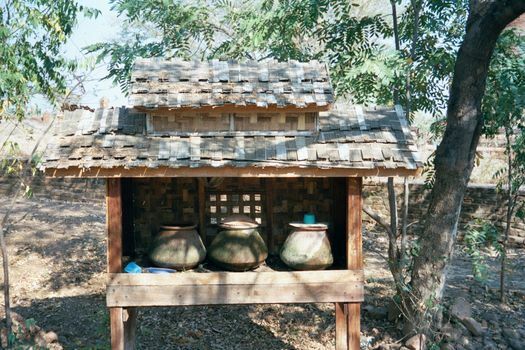 At the monastery's gate: water for passersby. This is Nan-hpaya. It's roughly contemporaneous with Kyauk-ku but a world apart from it: it's a gu, but this cave is entirely simulated in the shrine under the tower, or sikara. 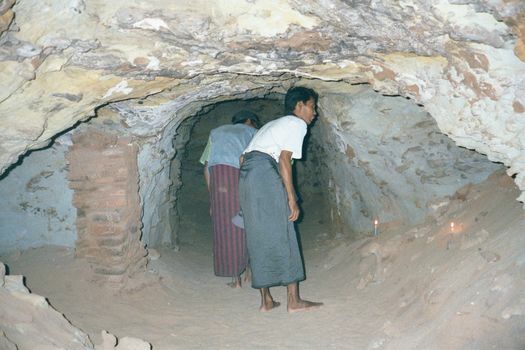 The tower is convex, unlike the earlier one at Nat-hlaung-kyaung. Convexity remained the rule in countless temples to come. 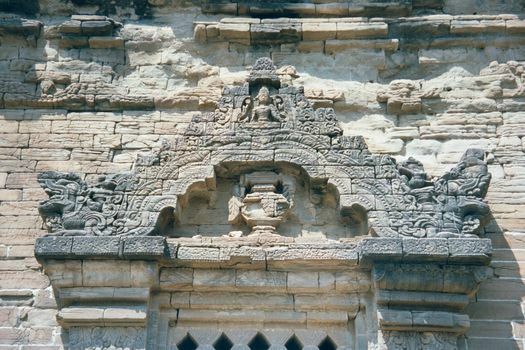 As at Kyauk-ku, the facing brick is actually sandstone, cut to resemble brick. The windows are perforated to keep light levels low. 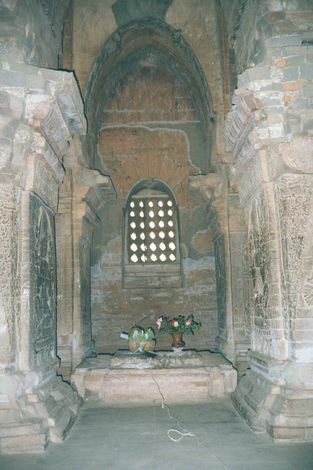 The V-shaped ornament on the sides of the window is characteristic of Pagan and appears for the first time here at Nan-paya. The temple originally had a porch, but it's been destroyed. Here, the pediment fronting the surviving entrance hall. The hamsa, a magical duck, makes its Pagan debut here. Inside, the dark shrine is a cubic room almost filled with four massive piers. They're too big simply to support the roof and tower. Instead, they're a philosophical lesson in stone. The lesson? That there's no difference between matter and void. Profound, if it catches you right. 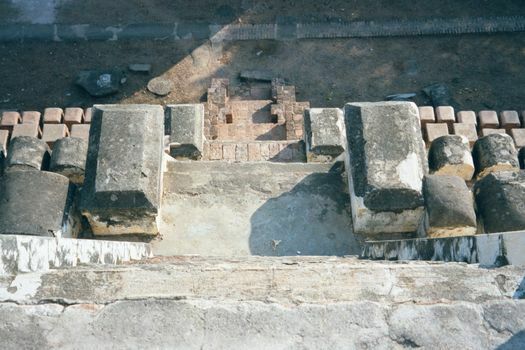 Each of the eight inward-facing sides of the piers has a carved image of Brahma, presumably once supportive of a now-vanished freestanding Buddha. Of such a statue, Anawrahta wrote: "I, King Anawrahta the Great, have cast this image of the Buddha. May I, by virtue of this act of merit, gain the bliss of nibbana during the dispensation of Arimettaya. "* Such was the motivation for most of the construction at Pagan: people with the means would erect a monument, stuff it with as much treasure as they could afford, endow it with hereditary slaves to maintain it in perpetuity--and hope that this banked merit would suffice to ensure that they'd be present when the next Buddha--Arimettaya by name--came, dispensing salvation. 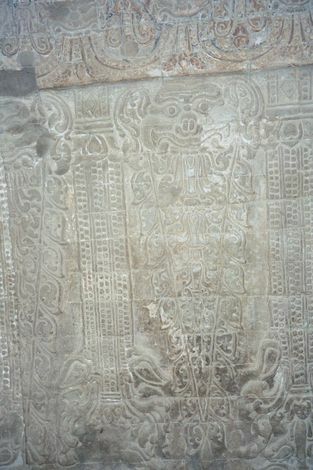 The other eight column faces are covered with decorations. Note the V-shaped wedge. Atop it is a kala, a mythical beast that symbolizes immortality and discharges torrents of vegetation from its jawless mouth. 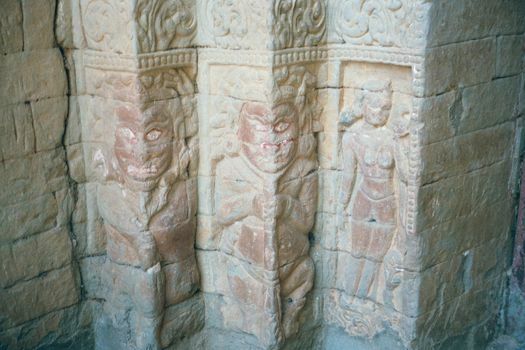 For more on this creature, see Cambodia: Angkor 8.